Entrance to the Oakridge–41st Avenue Canada Line Station. 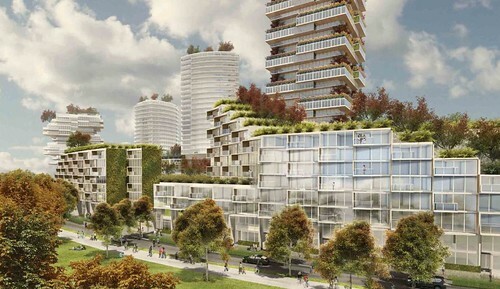 On February 18, 2014, City Council reviewed a report on the proposed Oakridge Centre rezoning, and recommended that the the proposed redevelopment proceed to public hearing. This sets the stage for a more formal opportunity for members of the public to weigh-in on the project in front of Mayor and Council — something that will likely take place in March of this year. Expect this hearing to be loud, as both supporters and opponents line up to have their say. The Vancouver Public Space Network has been following this proposed redevelopment for some time now. We know that it stands to be contentious. New towers with a significant increase in height and density, developed amidst what is a largely single-family neighbourhood, will generate opposition among many nearby residents. On the other hand, the area in question is both a transit hub and major commercial destination, another factor that needs to be fairly factored into the discussion. Then there is the specific set of considerations that emerge around public space. Higher buildings can have an impact on the experience of the public realm – though it important to note that this impact has both positive and negative dimensions. Views and shadowing and potential transportation impacts are one side of the equation. On the other: the proposed redevelopment attempts to offset the increased height and density (and additional population) with a number of significant public benefits – including parks and plazas, a redesigned ‘high street’ and other community amenities. The application draws attention to several significant public realm and transportation features, such as a proposed bike-share program, an increased emphasis on car-sharing, and multi transit options to the mall. Perhaps more significantly, from a public space perspective, the application proposes a 3.6-hectare rooftop park that would offer the benefits of a half-mile walking loop, large green space for non-programmed active recreation, and a water/art garden for the public to enjoy. If thoughtfully designed and executed, this could be a significant boon to the neighbourhood. A developer rendering of the proposed Oakridge Centre redevelopment. Part of the consultation materials produced in 2013. There’s been a lot of discussion around the rooftop park. Notwithstanding our support for plaza and park space, we feel that there are still some questions that need to be answered about how public this rooftop space will actually be. The grade-separated nature of the park may pose extra challenges to ensuring usage is optimized, and that the space is easily recognizable as a public facility. The adjacency to the mall will potentially blur the lines between public and private space – something that has been noted by the City’s Urban Design Panel, among others. This challenge could be further amplified depending on the way in which private mall security occupy the space. On top of that, there’s the challenge of just getting to the park. It’s an elevated space – which has the potential to create an accesibility issue. We feel that the rooftop open space must be freely open to the public, without barriers or conditions, yet the majority of access points to the park space will be through the mall itself. The report references public access to the rooftop via 45th avenue, but will one public access route be sufficient? The ground-level public spaces, including a transit plaza, are similarly encouraging – but again, the proof will be in the pudding. There is a mini-legacy of underperforming transit plazas in the city (and region). This could be a model for how to do one right, or not. Let’s keep our fingers crossed. The VPSN is encouraged by the inclusion of car-sharing options and a proposed cycling infrastructure and have consistently supported better, more active and sustainable modes of transportation (see, for example, our Route Map for Public Space Policy (2012-2014).) We do note that the proposed redevelopment references a private bike share program for residents and space for future Public Bike Share stations, the latter of which, currently seems to be in a bit limbo. In regards to the car-sharing program, we would discourage the development of a private car-sharing program but would encourage building upon and supporting the existing car-sharing options that are available in Vancouver so that non-residents have the potential for visitors to arrive by car share and therefore reduce the need for accommodating individual car parking. As part of the current application for the Oakridge Centre redevelopment, the VPSN is looking forward to continuing the conversation through the public hearing process. We welcome your thoughts on this project.